Lulu White was created as a response to perceived divisions existing between spectator and spectacle in a common opening ceremony (vernissage) at a gallery, museum, arts festival or market. 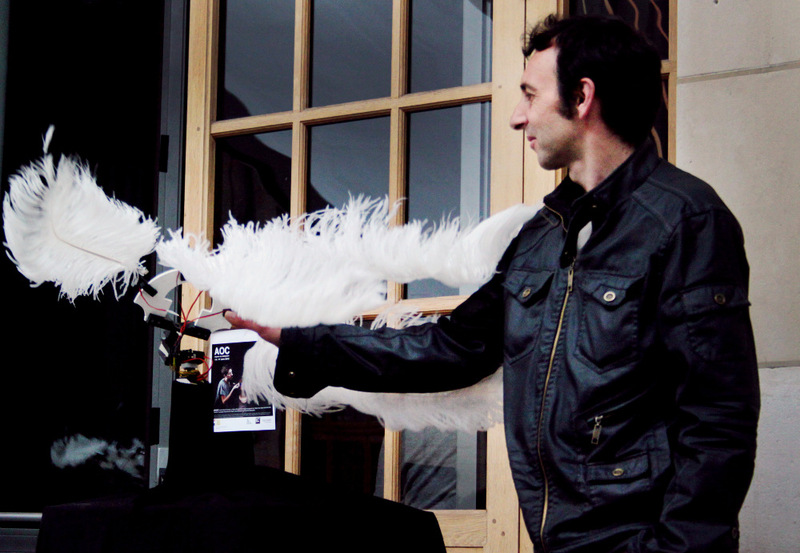 A performer wearing a wireless glove covered in sensors controls an object at long distance with real-time precision. This permits the performer to be in two places at once, to mingle with spectators, to join in social ritual, while also projecting his actions into the exhibition space, thus crossing the boundaries between the viewer and the viewed. Lulu White is tactile. Ostrich feathers represent fingers to touch spectators. The chosen aesthetic, as well as the name itself seeks to confront common definitions of 'the machine.' The subject of seduction and prostitution are approached and forced upon the machine.